I bought this eBook version for my mother during a Kindle sale, and I'm really thrilled with how easy it is to read and navigate. The Table of Contents lists each book of the Bible at the front of the file; once you drill down to the book you want, you can then hyperlink to the actual chapter you desire. It's incredibly easy to pick up, very intuitive, and that easy navigation is so crucial when dealing with a 1,000+ pages of eBook. I really like the formatting here. Zondervan has kept their "section headings" in place so the text isn't just broken up by chapter-and-verse but also by the topical sections. I never did see an example of footnotes -- but I grew up with the "study version" so maybe that doesn't come standard with this one. I think it's just as well; my mother wouldn't want to be hyperlinking back and forth between pages and notes. For myself, I like this translation, and I appreciate that Zondervan made an attempt at gender-neutrality where appropriate. There's really no point in arguing about this -- either you're going to prefer "let HIM take up HIS cross" or you'll prefer "let THEM take up THEIR cross", so pick which one you prefer and stick with that translation. If you're looking for a well-formatted eBook version of the Bible, you could do a lot worse than this version here. Four stars for stellar formatting and one extra star for reminding us that women read the Bible, too. 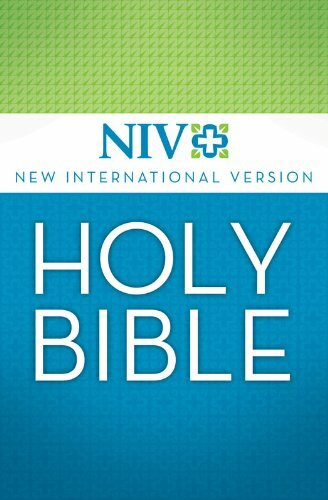 I take it from your comments at the end that you are reading the gender-inclusive edition of the NIV, which I have not read. This is not actually stated anywhere that I can see in your review, but the original, non-gender-inclusive edition is just as sexist as most English translations. It even introduces sexism where it was not in the original language, like many English translations. Two examples: In Romans 16, Paul namedrops a whole bunch of people, including Phoebe, a deacon, and Junia, "great among the apostles". In most English translations you will read that Phoebe was a deaconess and that Junia was actually Junias, a male name. I'd be interested to know how your copy renders that passage, if you have time and inclination. I use the NRSV, which is translated gender-inclusively, has a better level of scholarship and also a wider body of people among the team of translaters, representing a wider sample of Christian groups. It's never got the same level of support from English-speaking evangelicals, of course. Yes, this is the NEW New International Version that I bought on Amazon -- the reviews there were in a bit of a tizzy about the new gender-neutral language. I think it's a good thing, in general. 1I commend to you our sister Phoebe, a deacon, of the church in Cenchreae. 2I ask you to receive her in the Lord in a way worthy of his people and to give her any help she may need from you, for she has been the benefactor of many people, including me.3Greet Priscilla and Aquila, my co-workers in Christ Jesus. 4They risked their lives for me. Not only I but all the churches of the Gentiles are grateful to them.5Greet also the church that meets at their house.Greet my dear friend Epenetus, who was the first convert to Christ in the province of Asia. 6Greet Mary, who worked very hard for you.7Greet Andronicus and Junia, my fellow Jews who have been in prison with me. They are outstanding among the apostles, and they were in Christ before I was. I think it's a good thing, in general. As a baseline, I would think that gender-inclusive language that improves the technical accuracy of the translation should be uncontroversial, but sadly it isn't. IOW, if the original was gender-inclusive but the translation is sexist you've really stuffed up. As for gender-inclusive language that degrades the technical accuracy, I can see two sides to the issue. Many people take the text in front of them at face value and more-or-less call it a day. Even people who may not believe in biblical inerrancy. For that audience, I figure it's kind of legitimate to shoe-horn in as much interpretation as possible to the translation, shifting it from its original culture and context into ours. Not everyone has training or inclination to do that themselves. For myself, I prefer technical accuracy pretty much at all costs, provided the result is readable. I want to get into the heads of the original authors as best I can, and I know that they came from a very patriarchal culture and mistrust a translation that hides it. I want to do the cultural interpretation myself.